When researching new furnace cost, its important to understand the process and vocabulary associated with furnace replacements. Use our furnace installation guide to help you understand what you need to consider when choosing a new furnace, including tax credits, financing, and the vocabulary required. The below coupon can be printed or shown on your mobile device to get $200 off your next furnace installation. 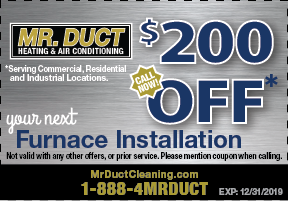 Call us to setup an appointment now at 1-888-4-MRDUCT. Make sure to mention the coupon when you call. Our knowledgable staff can discuss what options are available for replacing the furnace in your home.